The Humber River is the largest watershed in the Toronto and Region Conservation Authority (TRCA) jurisdiction, spanning 903 square kilometres from the headwaters on the Niagara Escarpment and Oak Ridges Moraine, down to the marshes and river mouth on Lake Ontario. In 1999, the Humber was given the designation of a Canadian Heritage River, which recognizes the Humber’s contribution to the development of the country and its importance in the history of First Nations peoples. This is a great beginner paddle suitable for families and individuals looking to learn a little more about the natural history of our city, parklands and waterways! This trip is designed to help newer paddlers improve their paddling skills, and to enable them to get out and explore local waterways on their own with confidence. After meeting in one of the parking lots at Sunnyside specifically the one at Lakeshore and Windermere (the closest parking lot to Humber River on the east side of the river), we will have an orientation and go over safety procedures. We’ll then embark on a relaxing paddle out to Lake Ontario, up the Humber River to the Bloor Street bridge and back. There will be plenty of time for nature photography and paddling tips provided by certified Complete Paddler guides. This tour also includes a park interpreteur from the Toronto and Region Conservation Authority (TRCA). 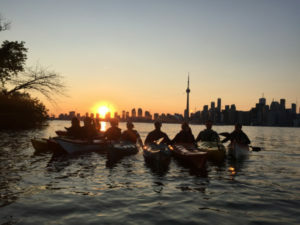 Paddlers on the Humber River History Adventure tour will gain knowledge of the rich human heritage and natural beauty of the Humber River, which affords urban dwellers with a sense of solace, renewal and connection with the past. This tour is beginner- friendly and suitable for all ages. An average fitness level is highly recommended. This trip is lead by certified instructors and all equipment is provided by The Complete Paddler. Kids under 14 must be accompanied by a guardian. The only gear you need to bring is warm clothing. Please arrive 15 minutes early. We may at times need to cancel or re-schedule an event due to low registration or inclement/adverse weather. Should this occur, participants will be notified, and all applicable fees will be refunded. Payments made by credit card will be credited back to the original card used for payment within 2-3 business days. Payments made by cheque or cash will be refunded by cheque in the mail, within 4 weeks. When you book a tour with us, a spot is set aside just for you. As such, a 48 hour cancelation policy goes into effect at the time of booking. If you cancel your spot with less than 48 hours notice, you will not be eligible for a refund. Please refer to our cancellation policy on our Lessons page.